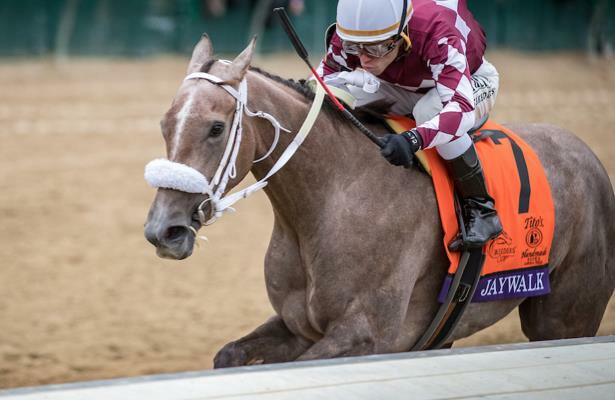 The juvenile filly champion was a no show Saturday when the real running started in the Grade 2, $200,000 Davona Dale Stakes, as 50-1 shot Jeltrin edged 13-1 runner Cookie Dough at the wire of the Kentucky Oaks prep. Jaywalk, coming off the layoff after winning the Breeders’ Cup Juvenile Fillies, offered little in the way of an excuse. She broke well from the rail, positioned outside of Cookie Dough through fractions of 24.21 and 47.41, but faded once in the stretch, finishing fourth as an odds-on favorite. The Davona Dale was the first start in four months for Jawalk. Jeltrin, a daughter of Tapizar trained by Alexis Delgado, finished a mile in 1:36.83 under jockey Luis Saez, earning 50 points toward the Oaks and a likely spot in the May 3 race at Churchill Downs should connections move forward on the trail. Delgado trained over 400 winners in Venezuela before moving stateside in 2017, where he learned about American racing from trainer Jenna Antonucci. Jeltrin, campaigned by ADR Racing Stable, LLC, was purchased by Juan C. Sanchez (C&J Stable) for $7,000 at the Keeneland September yearling sale, then at 2 was a $27,000 RNA in last April’s Ocala Breeders’ Sale. Entering Saturday, she had won one of five career starts back in October while running for a tag. She finished fourth in the Glitter Woman Stakes and Forward Gal Stakes (G3) prior to winning a photo finish in the Davona Dale. Behind the dueling leaders, Champagne Anyone ran third in the field of seven 3-year-old fillies.